A unique movie about people who are all about fun and craziness as they set out on a travel adventure. This is a movie that is unlike anything else. It’s about drag queens and transsexuals on a road trip across Australia. The things that happen to them would never happen to any other character in any other movie, because they all come out of who these characters are and the ways that people respond to them. The film goes all out when it comes to colorful and lavish costumes, and the boys enjoy wearing them, often for no good reason at all. What really make this movie work, however, are the humor and the actors. All three main characters are played by big name actors of today, who hadn’t really been discovered (with exception to Terrence Stamp), at the time of this film. And all three of them are really going for it here. The story is fun, but sometimes a little slow. The characters, on the other hand, are always lively. Priscilla, queen of the desert is a movie about three drag queens. They perform in shows, wear lavish costumes, and don’t really care about they way people look at them. Three fantastic actors play these three characters, and that’s a major reason why the film has so credibility. It’s a cult classic to be sure, but this one is well known to be a quality film, and the actors involved make up the number one reason for that. Each one of them is giving a go for broke performance, holding nothing back, and just having lots of fun with the role. These actors are Hugo Weaving; guy Pearce, and Terrence Stamp. Other than Stamp, the other two actors were not name stars when this movie was made. Terrence Stamp, being the oldest of the bunch, had his day in the sun a long time ago, with movies like superman II. But it wasn’t until a good three years after this movie that guy Pearce broke out with L.A. Confidential, and then two years later when Hugo Weaving had his matrix role. Now, all three actors are major players in the industry, and watching Priscilla, one can see why. At the start of the movie, tick (Weaving) finds himself a bus and a job performing out at a new hotel way out in another part of Australia. He convinces transsexual Bernadette (Stamp) to go along with him, and the two get ready to hit the road. That’s when we learn that there is a third member to this team. Tick has also invited Adam (Pearce), who is a loud-mouthed, flamboyant character who knows no shame. Bernadette is less than thrilled about this. Bernadette is the quiet, sullen type, and Terrence Stamp embodies the character perfectly. She is the exact opposite of Adam, never wanting to party or make a fool out of herself. She is also, the only one of the three of them, who has had an operation to become a woman. She and Adam are exact opposites, and they often get on each other’s nerves and have conflicts with each other. Tick, of course, is the middleman, who tries to keep everything under control. The movie has the boys riding cross-country, dealing with whatever obstacles get in their path. The first one is that their bus breaks down. Bernadette goes to find help and a nice couple picks her up, before they get a good look at her. Now Bernadette is riding in the car with them, and both members of the couple are clearly uncomfortable. They take Bernadette back out to the bus, and that’s when they get a glimpse of tick and Adam, all decked out in ridiculously colorful and lavish attire. No sooner does Bernadette get out of the car, then does the couple speed off, leaving them all behind. While on this bus ride, a major secret comes out about one of the characters and his back-story. That secret isn’t just in the past, but also has to do with where they are going, and what their future holds. In that way, this movie is better than most others that have a character with a secret past, which has nothing to do with the current plot. This movie makes its plot points count. Another situation that is handled really nicely is what happens when Adam calls Bernadette by her real name. Before she became a woman, Bernadette was a man known as Ralph, and in one drunken moment, Adam slips up and says that name out loud. He knows what he’s doing, but is too drunk to realize what the consequences might be, and Bernadette gives him a good beating for it. Adam is such a lively character that he doesn’t stop there, and in other scenes that come up later in the movie, he continues to test the line, never crossing it the way he did before, but also not completely leaving it alone. As the boys continue on their trip, they stop off in a town and meet a mechanic who takes them under his wing. This man is Bob, who is married to a mail-order bride who used to perform ping-pong ball shows in Thailand. This movie isn’t afraid to show us exactly what that means and where she can put the balls, and what she can do with them. The Bob plotline is a great one, because he really enjoys the company of the drag queens, and even loses his wife over it. Bob is really put to the test one night when he is hanging out with a bunch of guy friends and Adam comes strolling in looking for a date. Bob is speechless for a while, not wanting this crowd to know that he is affiliated with Adam, but when the scene turns to violence, Bob knows he has to stick up for his friend. I like the way the scene changed for that character, and how he wasn’t going to stand back and watch that happen, or allow it. The adventures of Priscilla, queen of the desert really are unlike any movie around. I never saw to Wong Foo Thanks For Everything, but from what I gather, it was the American attempt at making this film, being about three drag queens on a cross-country road trip, whose car breaks down. 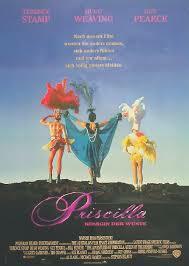 I can’t imagine that movie is very good, but Priscilla is the real deal. It is definitely a little slow at times, but even still, we have no idea where this movie is going, or what it is capable of. I really like the way that the end of the film answers questions, such as the possibility of one of them having a boyfriend. This movie really holds nothing back and lets it all hang out.